Brainy Girls! : Happy National Women's History Month! Happy National Women's History Month! Welcome to another issue of Brainy Girls! This is a special one-month issue to celebrate National Women's History Month. Throughout March, I hope that you're able to take some time and reflect on the awesome women who have inspired and influenced you in your life, those who have helped shape who you are and guided you along your path. We'll be reflecting on some of those women, so keep checking back to see what we have in store for you! Me and my mom being dorks at a Renaissance Faire. When I think of the women who have inspired me, three women immediately come to mind. First, my mom. Awwww. Yes, it's true - she's been my best friend and advocate my entire life. While she's had her struggles, I keep watching her carry on and move forward regardless of the challenges that she faces. We give each other strength and encouragement, and for that, I will be forever grateful. Second (and I've already posted about her), is cartoonist, painter, writer and teacher, Lynda Barry. My mom introduced me to Lynda's work when I was about eight years old and I've been an uber-fan ever since! You can read more about Lynda in my previous post, but she served as my creative role model and allowed me to believe that not everything has to be perfect and beautiful in order to be perfect and beautiful. Know what I mean? No? Well, check out some of Lynda's body of art and you'll see. Me and Ms. Cone when I visited her in 1999. Third on my list is my tenth and twelfth grade English teacher, Joan Cone. I was new to my high school in tenth grade, and I'm not sure Ms. Cone really liked me at first (largely due to some shenanigans a couple of my guy friends carried out in class and blamed on me, of which I was truly innocent). 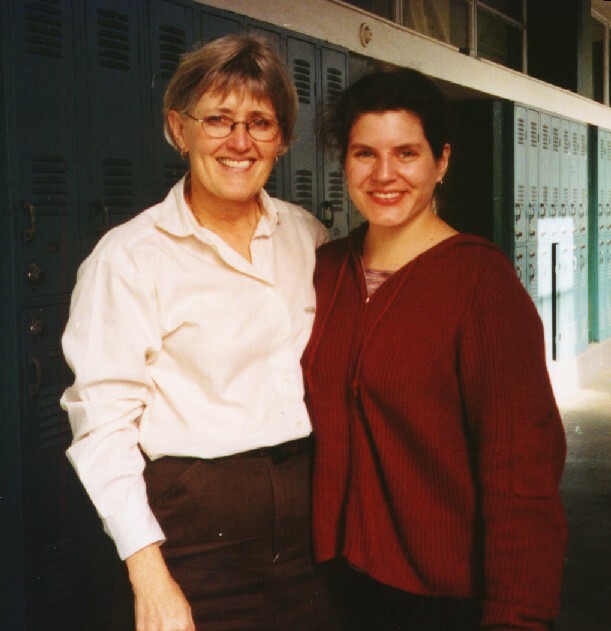 However, as we got to know each other throughout the school year (mostly through writing assignments and feedback), Ms. Cone instilled in me a confidence about my writing and ability to help others with their writing as well. I'm not trying to be all braggy or anything, but Ms. Cone let me write in my own style and said I was a natural writer, words that have stuck in my head through all these years. Additionally, as my twelfth grade AP English teacher, Ms. Cone guided me in my reading, assigning books that portrayed stories of women around the world. I loved those stories, and hope some day that I will write one of them. Or perhaps inspire someone else to write one! Maybe you! Who are your heroes? What do you love and who introduced you to it? Who helped you get where you are today? I look forward to hearing about the influential women in your life, whether they are famous faces from the past or from your family today. And it's International Women's Day, too!